Is 6 or 7 days safe? The RGS says it isn't. The Royal Geographical Society say you should spend 10 days climbing Kilimanjaro. Is 6 or 7 days safe? You should remember that for many years the RGS denied even the existence of snow on Kilimanjaro because snow at such a location was obviously scientifically impossible, and the missionaries who reported seeing it were not scientifically qualified. 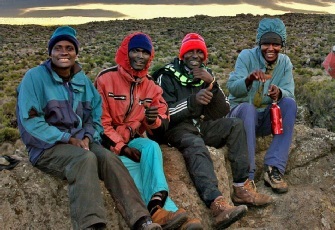 What is actually impossible is to watch thousands of climbers successfully and safely reaching the summit of Kilimanjaro every year with total disregard for the RGS’s "300 metres a day and 2 consecutive nights at the same elevation every third day" rule, without facing the unavoidable conclusion that they are simply wrong. You’re only as safe as your guide’s ability to anticipate the onset of your succumbing to a critical altitude-related condition once the early warning symptoms start to manifest, and his decisiveness in implementing a rapid evacuation plan, if necessary, or in ensuring that you descend from that point with an assistant guide to a lower elevation, if acceptable. My guides are all extremely attentive and astute and are in daily contact with me when on the mountain. We are grateful never to have lost a climber to date. Being involved with the media you probably noticed a group in the news recently who had a death at only 4,400m despite carrying all sorts of fancy and totally unnecessary equipment, which is deployed by certain companies that believe the fear-factor achieved in denigrating companies that don’t carry this unnecessary stuff achieves a marketing advantage for them. Our position is summarised on our mountain safety page. We like to make very clear at the outset that with regards to the dangers associated with high altitude, there is a small but significant risk of developing severe AMS or pulmonary or cerebral oedema, amongst those staying overnighting in the crater. In order to best minimise this risk, we summit first prior to sleeping in the crater, thereby ensuring that we observe an imperative principle of acclimatisation, ‘climb high, sleep low’, at this critical altitude. You should also be aware that amongst those requesting to spend a night in the crater; around 20% change their minds while on the mountain after consulting with the guide and agreeing that they have failed to obtain a sufficiently safe level of acclimatisation for this option. You would need to be aware of all of these considerations before moving ahead with a crater excursion request.